The U.S. is known for producing goods on a mass scale. It provides what is often the largest market for just about anything that can be bought or sold. And it is this large scale that one must assign blame when considering the quality of most cheeses made domestically. Since the industrial revolution, most craft-created cheeses have essentially disappeared from the nation’s landscape. But there are some cheese artisans out there and our mission is to track them down and bring the fruits of their labor—technically the “cheeses” of their labor—to you. Zingerman’s is our partner in the effort. Founded by John Loomis and Dave Carson in the fall of 2001, Zingerman’s Creamery is the newest member of the award-winning Zingerman’s Community of Gourmet Businesses. For those of you who aren’t familiar with the culinary gurus at Zingerman’s, let us just tell you, we’ve been relying on their expertise for years now. A regular supplier of the cheeses we feature in the club, the folks at this fine family of companies employ trained experts who professionally seek out the finest cheeses (and other gourmet items) the world over. They’ve been integral in bringing back to the States the nearly lost traditions of fine cheese making and thus reacquainting countless patrons with artisan cheese treasures. Located in Manchester, Michigan, Zingerman’s Creamery is dedicated to bringing fabulous-tasting, hand-crafted fresh cheeses, gelato and more to dairy lovers everywhere. John Loomis is also the company’s sole cheese maker. 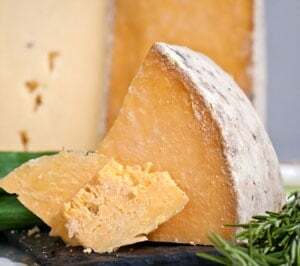 He began making cheese about twenty years ago after spending a year working with various cheesemakers in the mountains of Wales, the west of England, and County Cork, Ireland. Upon his return to the States, he set up a small family-run cheesemaking dairy with his brothers and sister in Ann Arbor. Their first cheese, Great Lakes Cheshire, was met with acclaim. Approximately five years later, the family closed the operation, and John went to work selling and buying cheese for Zingerman’s Delicatessen. John, along with Zingerman’s owners Ari Weinzweig and Paul Saginaw, always had in mind the idea of starting their own dairy to produce cheeses for Zingerman’s. They would, of course, supplement the many artisan cheeses they scouted from around the world, the U.S. included. Three years ago they made the leap and set up on a small farm roughly thirty miles west of Ann Arbor. There John began making fresh cream cheese using recipes and techniques similar to those used fifty years ago. His cream cheeses proved so popular that they began branching out into other cheese styles. 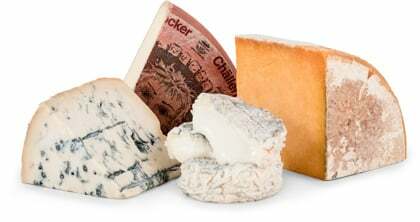 Their natural ingredients and traditional techniques are in sharp contrast to other commercially available cheeses. (There’s little doubt, nearly all “advancements” in the dairy field in recent times have been directed towards extending shelf-life and improving profits, usually at the expense of flavor.) Thanks to John’s expertise and Zingerman’s drive to produce only the highest quality, flavorful, craft cheese, their creamery brings back the tradition of handcrafted cheesemaking. The goat’s milk for your City Goat Round comes from several different farms in Michigan with a mix of Nubian and Alpine goats. The milk is pasteurized at the lowest temperature allowed by law, a process that’s so time consuming, few U.S. producers use it, but John feels it’s the best way to preserve the integrity and flavor of the milk. The milk is then set using the more traditional overnight, or long time sets (the time varies anywhere from 10 to 14 hours depending on season). This long setting time allows more complex and diverse flavors to develop in the cheese, and it’s one of the many distinguishing practices used by the creamery to yield wonderfully fresh cheeses. Its taste is unlike anything else—mild and subtly sweet with only the very softest hint of tanginess. Cut into it and you’ll discover it’s firm but yielding in texture. We owe John and the rest of the folks at Zingerman’s a debt of gratitude for their efforts—and after tasting the cheese we’ve sent you, we hope you share our sentiments. The humble chevre is an especially versatile cheese. This classic fresh goat’s milk round (chevre means goat in French) may be spread with jam on toast as a light, slightly tangy version of cream cheese. Drop dollops on pizza or stuff it under the skin of a chicken breast. Melt it into mashed potatoes. It goes well with dried fruits (especially figs), piquillo peppers and toasted walnuts. And, drizzled with honey, it makes a simple, wonderful and elegant dessert.